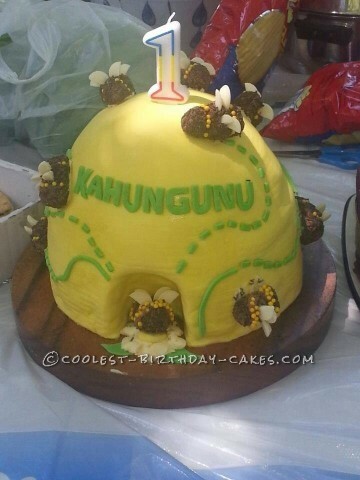 This beehive cake is the first cake I made for someone else. My cousin initially asked my sister to make a cake for his son’s 1st birthday. She declined and said ‘ask Bubby, she’s the creative one’ (I’m Bubby by the way) and because I had the ingredients and I was too cheap to get the kid a present, I did it. His mum told me she’d like a tiger or a bumble bee so I set off on my cake making adventure. I had a couple of those Betty Crocker cakes in a box so I made them and they were a bit flat, but I decided they would do. Then, I had a major epiphany that I wanted a beehive with bees so I looked at the pitiful height my cake was and bought 2 sponge cakes from the supermarket. As I was about to start carving the beehive shape out of my stack of cakes I realised I had nothing holding the layers together so instead of whipping up some butter cream or some other fancy frosting I pulled out my beloved jar of Nutella and spread it about 1/2 an inch thick between each layer of cake. I rolled out some fondant I hadthat was coloured yellow, and green. Placing the fondant nice and smoothly over the cake was a bit tricky because I had never done it before. There were cracks and folds everywhere. I scoffed at it and then set off at painstakingly cutting out the individual letters of an unnecassarily long name and some small lengths of green to make dotted line trails. With my fondant in place looking a bit worse for wear, I started making bees which were just rolled up balls of cake off-cuts and nutella mixed together. I managed to seperate black and yellow sprinkles from the rest and rolled my bees in strips of sprinkles. With Nestle melts cut in half for wings, I completed my bees and worked on strategically placing them over cracks and imperfections in the fondant. When I arrived at the park where the birthday was I had stares, and compliments, follow me all the way to the gathering. It wasn’t just because of my unwavering good looks. Nobody expected me to have created a tasty, good looking cake. I was a little put out at the references to exceeding expectations, but still very proud of what I accomplished.